A vintage look from the 1980's that still works today. 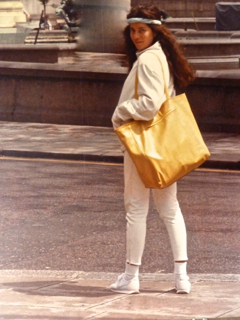 Jackie Robbins modeling her handmade skinny white leather jeans, white leather jacket, and leather shopping bag purse in London. Contact us for pricing on any of these items that can been modified to represent today's current trends and use your leather investment for the next 30 years! Available in a wide variety of colors in leather or suede, or even "no-animal" leather-like fabrics.